Has Lord Rama have given any instructions to artists on how to conduct oneself and can we find any information on how should an King treat the musicians/singers? A King should treat all artists with utmost care and respect. Both Kamba Ramayana and Valmiki Ramayana starts with the explanation on Ayodhya city. Both Poets Kambar and Valmiki have described, Ayodhya was filled with excellent singers, dancers and other artists, who were praised and honoured well. Bharata comes to Chitrakoot to ask Rama to return to Ayodhya and rule the kingdom. Although Bharata tried in various ways to coerce Lord Sri Rama to return to Ayodhya as king, the lord didn't accept it. Lord Rama even doesn't know the death of king Dasaratha. In 100th sargam of Ayodhya Kandam, Thinking that Pattabhishekam of Bharata is done. Lord Rama asks Bharata series of questions on welfare of the kingdom. We should focus on these questions carefully. 01. I hope that ministers who are valiant like you, learned, masters of their senses of noble birth and skilled interpreting internal sentiments by external gesture, are assigned to you. 02. I hope that you do not deliberate alone nor indeed with numerous men. I hope your decision arrived at by you through such deliberation does not flow to the public (even before it is carried out). 03. I hope that you consult with three or four ministers as mentioned in scriptures any proposal collectively and singly with each of them in secret. 04. I hope you solicit for one wise man rather than for a thousand stupids for, a wise man can be of a great help to you in difficult matters. With these series of questions Lord Rama enquires about people's welfare and mentions about artists in general. Some questions indicate if the singers are singing for Bhakti, God? Are they good people and is your treasury going to them. Are they also focused on giving their utmost performance with a pure heart without expecting anything in return?. Therefore mind of artists should be pure and elevated and no fruits should be expected in return. Then this definitely would transform into Bhakti and lead us to Mukthi for sure. Naadam (divine sound) is an important subject to us. In most cases Naadam comparison is related to Lord Shiva (Naadha Thanumanisham Shankaram), Devi Goddess (in lalitha sahasranamam, trishati), Lord Muruga (Natha vinthu kalathi namo). And Why, Lord Rama is not described as Naada Vadivu (Form)? The last line of above sloka clearly tells us, One who hears Rama Naadam which is in the form of Rama Katha and Rama Nama will sure attain Mukthi. Hence, Rama Katha and Rama Namam are Naadam. In below conversation, Velukkudi Sri U. Ve. Krishnan Swami raises the questions and the same is answered by Sri Vijay Shiva. Sri Thyagarajar Swami took birth and lived for Rama only. What does he talk about Ramayana and about Lord Rama? He also points out to Kirtan which describes the incident when Rama tries to convince Ravana to return Sita using - Sama, dhana, bheda, danda. As Sama - advising kindly, danam - giving Ayodhya in return, Assuring moksham to him as he had given to his brother, Vibhishana and finally about punishing him. Each of his kirtan will be a reference to an incident in Ramayanam. This is Thygarajar's major contribution. That is why when we listen to Thygaraja Kirtans, we get the feeling of listening to Ramayana. In which music was epic Ramayana sung, Carnatic or Hindustani? In Ramayana it is said: "pramanais tribhir anvitam" the 3 pramanas being: vilambit, drut, madhyam. These three seem to be connected with Hindustani music. These 3 are indeed common for entire Indian music - be it carnatic or hindustani or any other. Vilambit means singing in slow tempo, madhyam - medium tempo and Drut - fast tempo. The difference in hindustani and carnatic comes only after invasion of Mughals. The existing music in North became Hindustani by Persian influence and the south version became carnatic. During Lord Rama's rule there was only one music all over the country and there is no proof of any difference. That obviously must have been carnatic as there was no persian influence during that period. Do we have the custom of singing Valmiki or Kamba Ramayana verses in music concerts? If it is sung, do people enjoy it? The tradition of singing verses in musical concerts has not yet come into practice. Reason is because of knowledge deficiency in the verses. We get complete joy by singing Thyagarajar's or Dikshitar's composition and so, we don't have the need to render Valmiki or Kambar's verses. 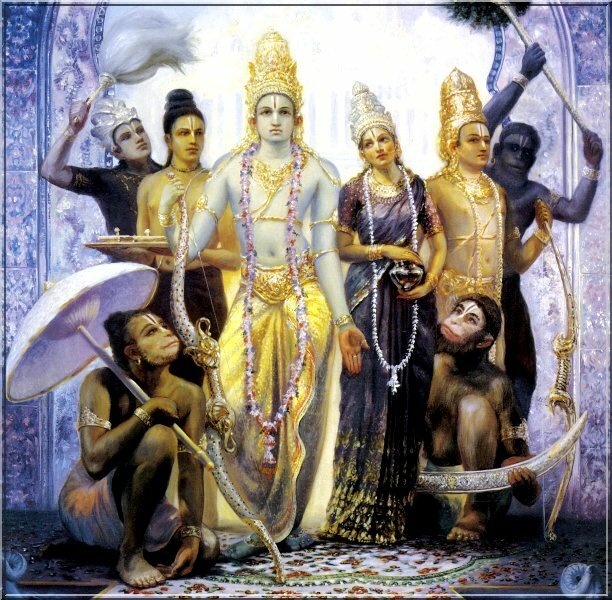 That means just like Lord Rama's different avatarams, Ramayana itself has taken several different forms in its own way. In Brahma's Satya loka, Ramayana was 100 crore verses. That has come down as 24000 verses composed by Sage Valmiki in Valmiki Ramayanam and has been 10000+ composed by Kambar in Kamba Ramayana, similarly the epic has been rendered into different Kirtans by great scholars. When we do upanyasams/parayanams (discourse) on a specific topic, we do it for an hour or more and people understand and enjoy it. But while singing, music vidvan's (very learned/having known) do not explain the meaning of the verse but only sing and yet people enjoy it. How do you achieve this? We have not achieved it but instead music has done it for us. We have four important amsas - Purity of the note (Swara Shuddham), Rhythmic content (layam), Tonal Power (it might be musical instrument or human voice), Hridaya Bhavam [feeling from heart]. Even if any two of these are strong, we can bind the audience even for 4 hours and that's the power of music. Especially if you sing with meaning, definitely that becomes Deiva Ganam (Divine Rendition) and as you say it will become a path to Moksha. So, music is beyond speech.